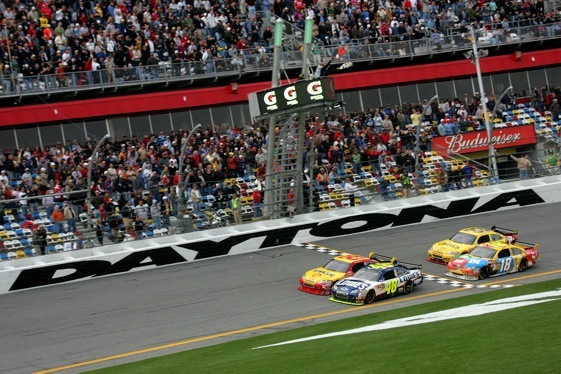 Daytona Beach, Fla. – NASCAR official Robin Pemberton’s ominous “Boys, have at it’’ announcement a few weeks ago gave media and race fans visions of flying race cars this week at Daytona. With the well-publicized slump in TV ratings and visibly empty seats at most of its racetracks, NASCAR has come to the obvious conclusion that it needs to spice things up to regain people’s interest. One way to do that is put the racing back in the hands of the drivers and spend less time making restrictive rules. The biggest step in that process so far was Pemberton’s announcement that restrictions on bump drafting at Daytona and Talladega, the two tracks where that tactic is most used, have been eliminated. In 2006, two-time NASCAR Sprint Cup championTony Stewart sounded the alarm that somebody could be badly injured or killed if NASCAR didn’t crack down on the wild bump drafting in the turns at the big tracks. Two days later, NASCAR announced “no zones,’’ areas in the turns where overzealous bump drafting would be penalized. It worked. Drivers began minding their manners and bump drafting – the art of slamming into the rear of the car in front of you to gain momentum for both cars – was generally put in check. So NASCAR made some changes over the winter. Another big one is opening up the carburetor restrictor plates that are used at Daytona and Talladega to reduce horsepower and keep the big stock cars under 200 mph in the interest of driver and spectator safety. The openings here this week are the biggest in nearly two decades of plate racing, giving the drivers more horsepower and, even more important, better throttle response to react to tight situations. Stewart, the guy who complained the most when things got crazy a few years ago, shrugged off the latest changes. There have been some multi-car crashes in practice for both the Budweiser Shootout last week and this week prior to the Gatorade Duals. But the races themselves were pretty quiet. Carl Edwards had another viewpoint, although he strongly supported the changes. “There will be guys that just go at it, but there always are,’’ Edwards said. “It hurts when you hit the fence, (and) not just physically. That’s not the way anyone wants to start their season. Edwards expects more of the same on Sunday – for most of the race. Three-time 500 winner Jeff Gordon said the current cars are a handful to drive. “The bigger plate definitely carries a lot of speed off into the corner,’’ he said. “We’re still seeing a lot of bump-drafting and you’ve really got to use the tools that NASCAR is giving us to make the cars handle good, too.